Come and see wedding jewellery Melbourne the flirtatious earrings will capture the sweet romance of your big day. Made with beautifully shaped teardrop stones that dangle from a delicate floral motif. Ultimately can be worn with a tenderly tousled up-do and pastel soft lip for a timeless, romantic bridal look. Elegant and oh so sweet, you’ll just adore the feeling you get when wearing the flirtatious earrings. Just treasure the love you share with your new husband. And relive the memories of the happiest day of your lives each time you wear these beautiful pieces. Matches perfectly with silver headbands. ‘Little Lovelies’, by Leah S Designs is an exquisite collection of delicate pieces. Chosen to add just the right sparkling finish to any special occasion. 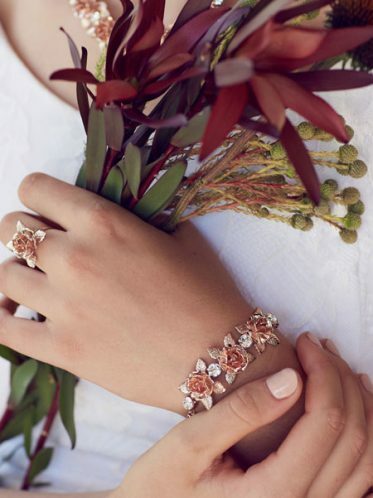 Leah S Designs displays the best jewellery for brides and bridesmaids Melbourne has to offer. Featuring a collection of matching jewellery sets, belts and hair pieces that are truly spectacular when paired with the bridal gowns of our Leah S Designs Collection. Maybe these earrings would make a beautiful gift for the whole bridal party! Flirtatious designed and made in Melbourne. You may also like our Royal design.